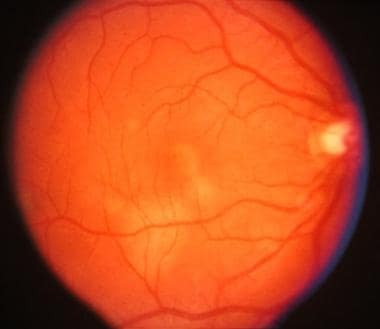 First described by Gass in 1968, acute posterior multifocal placoid pigment epitheliopathy (APMPPE) is an acquired inflammatory disorder affecting the retina, retinal pigment epithelium, and choroid of otherwise young healthy adults. The disease is self-limited and is characterized by multiple yellow-white placoid subretinal lesions of the posterior pole, as shown below. The lesions are frequently bilateral and in various stages of evolution, typically resolving in weeks to months and leaving circumscribed areas of retinal pigment epithelial disturbance. Posterior pole of right eye. 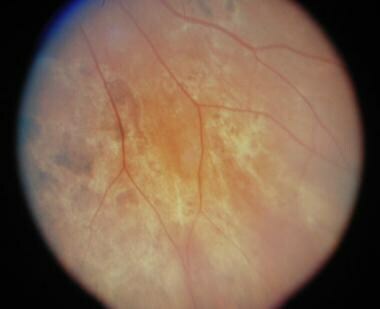 Early acute posterior multifocal placoid pigment epitheliopathy lesion shows yellowish-white placoid lesion involving the macula and an area just inferior temporal to the macula. Posterior pole of left eye of same patient showing acute posterior pole placoid lesion. Inferior nasal of right eye of the same patient approximately 2 months later, showing scattered areas of retinal pigment epithelium atrophy and hyperplasia. Visual acuity may be affected significantly if the macula is involved, but recovery is the rule with or without systemic therapy, with 80% of those eyes affected achieving a visual acuity of 20/40 or better. The cause is unknown but believed to be a hypersensitivity-induced vasculitis involving not only terminal choroidal lobules but also diffuse systemic large and small vessels. The pathophysiology of APMPPE is somewhat speculative. Two major theories concerning the pathogenesis of APMPPE have been proposed based on clinical and diagnostic findings. No histopathological evidence is available on acute or subacute stages of the disease. Other findings suggestive of vasculitis include episcleritis, erythema nodosum, microvascular nephropathy, thyroiditis, optic neuritis, labyrinthitis, hearing loss, and cerebral angiitis. Meningoencephalitis occasionally has been observed. The incidence and prevalence of APMPPE is unknown. However, since the landmark description of Gass, APMPPE has been reported frequently and widely from ophthalmic centers, primarily in the United States and Western Europe. Most US patients reported in the literature reside in the northern and midwestern states. Reports in the international literature have included patients from northwestern European countries, such as England, Scotland, France, Belgium, the Netherlands, and Denmark. Several reports have originated from Japan. Reports from other geographic areas have been sparse. APMPPE usually affects healthy adults, and, other than ocular involvement, systemic manifestations are relatively uncommon. When they do occur, many systemic manifestations are usually mild and transient in nature; however, the presence of cerebral vasculitis has been associated with permanent neurologic sequelae, such as hemiparesis and even death from intracerebral edema and brain herniation in rare instances. Almost 80% of the recorded cases include whites, with the remainder being Japanese, African American, Nepalese, and from the Indian subcontinent. Whether this racial distribution represents a predilection of APMPPE for whites or a reporting bias is unclear. Earlier reports of APMPPE suggested a slight preponderance of women with this disease, but more recent publications suggest no sexual predilection, with equal frequency between both men and women. The mean age of onset is approximately 27 years. The documented age range of onset is 7-66 years. The most frequent age range of occurrence of APMPPE is in those patients aged 16-40 years, representing approximately 85% of cases. About 50% of patients present in the third decade of life. Heiferman MJ, Rahmani S, Jampol LM, Nesper PL, Skondra D, Kim LA, et al. ACUTE POSTERIOR MULTIFOCAL PLACOID PIGMENT EPITHELIOPATHY ON OPTICAL COHERENCE TOMOGRAPHY ANGIOGRAPHY. Retina. 2017 Feb 1. [Medline]. Yang DS, Hilford DJ, Conrad D. Acute posterior multifocal placoid pigment epitheliopathy after meningococcal C conjugate vaccine. Clin Experiment Ophthalmol. 2005 Apr. 33(2):219-21. [Medline]. Mendrinos E, Baglivo E. Acute posterior multifocal placoid pigment epitheliopathy following influenza vaccination. Eye (Lond). 2010 Jan. 24(1):180-1. [Medline]. Fine HF, Kim E, Flynn TE, Gomes NL, Chang S. Acute posterior multifocal placoid pigment epitheliopathy following varicella vaccination. Br J Ophthalmol. 2010 Mar. 94(3):282-3, 363. [Medline]. Baxter KR, Opremcak EM. Panretinal acute multifocal placoid pigment epitheliopathy: a novel posterior uveitis syndrome with HLA-A3 and HLA-C7 association. J Ophthalmic Inflamm Infect. 2013 Feb 4. 3(1):29. [Medline]. [Full Text]. Yeh S, Forooghian F, Wong WT, Faia LJ, Cukras C, Lew JC, et al. Fundus autofluorescence imaging of the white dot syndromes. Arch Ophthalmol. 2010 Jan. 128(1):46-56. [Medline]. [Full Text]. Grkovic D, Oros A, Karadžic J, Bedov T, Gvozdenovic L, Jovanovic S. Acute posterior multifocal placoid pigment epitheliopathy-retinal "white dot syndrome". Med Glas (Zenica). 2013 Feb. 10(1):194-6. [Medline]. Aoyagi R, Hayashi T, Gekka T, Kozaki K, Tsuneoka H. Multifocal electroretinographic evaluation of macular function in acute posterior multifocal placoid pigment epitheliopathy. Doc Ophthalmol. 2013 Jun. 126(3):253-8. [Medline]. Cheung CM, Yeo IY, Koh A. Photoreceptor changes in acute and resolved acute posterior multifocal placoid pigment epitheliopathy documented by spectral-domain optical coherence tomography. Arch Ophthalmol. 2010 May. 128(5):644-6. [Medline]. Goldenberg D, Habot-Wilner Z, Loewenstein A, Goldstein M. Spectral domain optical coherence tomography classification of acute posterior multifocal placoid pigment epitheliopathy. Retina. 2012 Jul. 32 (7):1403-10. [Medline]. [Full Text]. Mrejen S, Gallego-Pinazo R, Wald KJ, Freund KB. Acute posterior multifocal placoid pigment epitheliopathy as a choroidopathy: what we learned from adaptive optics imaging. JAMA Ophthalmol. 2013 Oct. 131 (10):1363-4. [Medline]. [Full Text]. Michael A. Klufas, MD , Nopasak Phasukkijwatana, MD , Nicholas A. Iafe, BA , et al. Optical Coherence Tomography Angiography Reveals Choriocapillaris Flow Reduction in Placoid Chorioretinitis. Ophthalmology Retina. January–February 2017. Volume 1, Issue 1:77–91. [Full Text]. Hirooka K, Saito W, Saito M, Hashimoto Y, Mori S, Noda K, et al. Increased choroidal blood flow velocity with regression of acute posterior multifocal placoid pigment epitheliopathy. Jpn J Ophthalmol. 2016 May. 60 (3):172-8. [Medline]. Mrejen S, Sarraf D, Chexal S, Wald K, Freund KB. 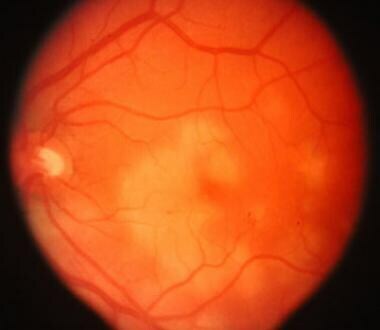 Choroidal Involvement in Acute Posterior Multifocal Placoid Pigment Epitheliopathy. Ophthalmic Surg Lasers Imaging Retina. 2016 Jan. 47 (1):20-6. [Medline]. Mavrakanas N, Mendrinos E, Tabatabay C, Pournaras CJ. Intravitreal ranibizumab for choroidal neovascularization secondary to acute multifocal posterior placoid pigment epitheliopathy. Acta Ophthalmol. 2010 Mar. 88 (2):e54-5. [Medline]. Fiore T, Iaccheri B, Androudi S, Papadaki TG, Anzaar F, Brazitikos P, et al. Acute posterior multifocal placoid pigment epitheliopathy: outcome and visual prognosis. Retina. 2009 Jul-Aug. 29 (7):994-1001. [Medline]. Bugnone AN, Hartker F, Shapiro M, Pineless HS, Velez G. Acute and chronic brain infarcts on MR imaging in a 20-year-old woman with acute posterior multifocal placoid pigment epitheliopathy. AJNR Am J Neuroradiol. 2006 Jan. 27(1):67-9. [Medline]. [Full Text]. Di Crecchio L, Parodi MB, Saviano S, Ravalico G. Acute posterior multifocal placoid pigment epitheliopathy and ulcerative colitis: a possible association. Acta Ophthalmol Scand. 2001 Jun. 79(3):319-21. [Medline]. Howe LJ, Woon H, Graham EM, Fitzke F, Bhandari A, Marshall J. Choroidal hypoperfusion in acute posterior multifocal placoid pigment epitheliopathy. An indocyanine green angiography study. Ophthalmology. 1995 May. 102(5):790-8. [Medline]. Hsu CT, Harlan JB, Goldberg MF, Dunn JP. Acute posterior multifocal placoid pigment epitheliopathy associated with a systemic necrotizing vasculitis. Retina. 2003 Feb. 23(1):64-8. [Medline]. Lim LL, Watzke RC, Lauer AK, Smith JR. Ocular coherence tomography in acute posterior multifocal placoid pigment epitheliopathy. Clin Experiment Ophthalmol. 2006 Nov. 34(8):810-2. [Medline]. Lofoco G, Ciucci F, Bardocci A, Quercioli P, Steigerwalt RD Jr, De Gaetano C. Optical coherence tomography findings in a case of acute multifocal posterior placoid pigment epitheliopathy (AMPPPE). Eur J Ophthalmol. 2005 Jan-Feb. 15(1):143-7. [Medline]. Lowder CY, Foster RE, Gordon SM, Gutman FA. Acute posterior multifocal placoid pigment epitheliopathy after acute group A streptococcal infection. Am J Ophthalmol. 1996 Jul. 122(1):115-7. [Medline]. Mensah E, Vafidis GC. Acute posterior multifocal placoid pigment epitheliopathy in a 7-year-old girl. J Pediatr Ophthalmol Strabismus. 2002 Jul-Aug. 39(4):239-41. [Medline]. O'Halloran HS, Berger JR, Lee WB, Robertson DM, Giovannini JA, Krohel GB, et al. Acute multifocal placoid pigment epitheliopathy and central nervous system involvement: nine new cases and a review of the literature. Ophthalmology. 2001 May. 108(5):861-8. [Medline]. Scheufele TA, Witkin AJ, Schocket LS, Rogers AH, Schuman JS, Ko TH, et al. Photoreceptor atrophy in acute posterior multifocal placoid pigment epitheliopathy demonstrated by optical coherence tomography. Retina. 2005 Dec. 25(8):1109-12. [Medline]. [Full Text]. Smith CH, Savino PJ, Beck RW, Schatz NJ, Sergott RC. Acute posterior multifocal placoid pigment epitheliopathy and cerebral vasculitis. Arch Neurol. 1983 Jan. 40(1):48-50. [Medline]. Thomson SP, Roxburgh ST. Acute posterior multifocal placoid pigment epitheliopathy associated with adenovirus infection. Eye. 2003 May. 17(4):542-4. [Medline]. Uthman I, Najjar DM, Kanj SS, Bashshur Z. Anticardiolipin antibodies in acute multifocal posterior placoid pigment epitheliopathy. Ann Rheum Dis. 2003 Jul. 62(7):687-8. [Medline]. Wolf MD, Folk JC, Panknen CA, Goeken NE. HLA-B7 and HLA-DR2 antigens and acute posterior multifocal placoid pigment epitheliopathy. Arch Ophthalmol. 1990 May. 108(5):698-700. [Medline]. El-Markaby HS, Mohammed TH, El-Raggal TM. Acute posterior multifocal placoid pigment epitheliopathy: role of TNF blocker in severe cases. Retina. 2012 Nov-Dec. 32 (10):2102-7. [Medline]. Gendy MG, Fawzi AA, Wendel RT, Pieramici DJ, Miller JA, Jampol LM. Multimodal imaging in persistent placoid maculopathy. JAMA Ophthalmol. 2014 Jan. 132 (1):38-49. [Medline]. Fluorescein angiography showing peripheral hypofluorescence and central leakage of the lesion inferior temporal to the macula. Fluorescein angiogram of the patient above in late phase showing late staining of placoid areas. Fluorescein angiography of same patient in late phase showing areas of late staining. This image shows localized scleritis superiorly. The authors and editors of Medscape Reference gratefully acknowledge the contributions of previous coauthor, James P Ganley, MD, PharmD, DrPH, to the development and writing of this article.